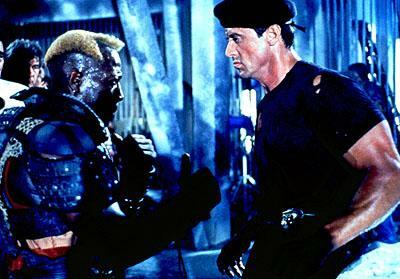 Stallone has made a lot of action films but Demolition Man is probably one of my favorites. I think it’s because of how well they blend comedy into the film. I mean, the seashell thing alone is hilarious. 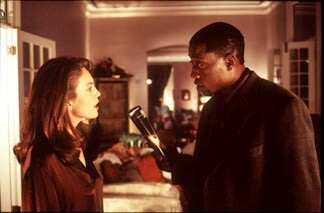 Snipes helps make this film a classic with his awesome turn as bad guy Simon Phoenix. I’ve always loved New Jack City or, as I called it at the time, the film that will relaunch Judd Nelson’s career! NJC is pretty dated but also kind of encapsulates the time period very well. Hip Hop had just found its way into popularity and this film was the 90’s attempt to depict Hip Hop culture and life on the modern-day mean streets. 3. WHITE MEN CAN’T JUMP. 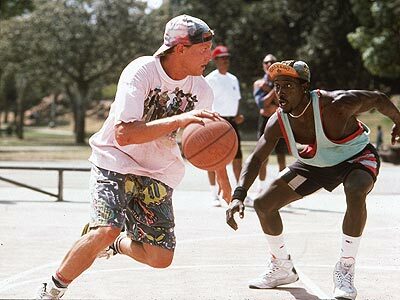 The great thing about White Men Can’t Jump? It’s a friggin’ great movie that I still find hilarious and utterly watchable. The bad thing about White Men Can’t Jump? It lead to Money Train getting a greenlight. Oh well, still a great film and well worth the watch if you haven’t seen it. I’ve doted on this film enough in the past years so I’ll be brief. 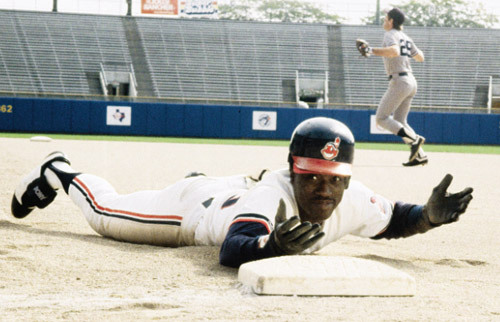 Quite simply, it’s one of my favorite comedies and Snipes is great in it as Willie Mays Hayes. Way better than Omar Epps was in the sequels. God, I love the daywalker. To this day, I think this film has one of the best openings in film history! I also hold steadfast to the belief that it is very much responsible for the Comic Book Movie Boom of the 2000’s. In fact, I think it was a bit of an experiment to see if Comic Book characters could draw folks to the box office. It drew me to the cinema 3 times… and I’ve seen every Comic Book Movie since! This entry was posted on April 25, 2011 at 6:15 am and is filed under Top 5 Movies with tags Wesley Snipes. You can follow any responses to this entry through the RSS 2.0 feed. You can leave a response, or trackback from your own site. Great List! New Jack City and White Men Can’t Jump are my two main favorites from him because he has that amazing charisma and charm that carries on throughout both films. Good stuff here! 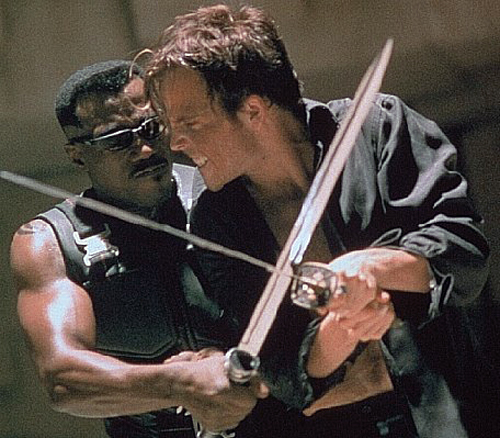 Yeah… they inspired this list actually but I love MLeague and Blade so much that I couldn’t waiver! I’ll take the sports ones as my favorites, with Demo Man placing third. Wesley was a badass, man…he’s long overdue for his comeback! Though I give Epps credit – he was basically impersonating Snipes, and sure, the character got retarded, but he did solid work. Agreed on Epps and Snipes. I so had hoped that Brooklyn’s Finest would have been his comeback but, oh well. Blade 2 is better for my money, but Snipes still ruled something fierce in the first one. Strange though, I’ve always preferred him in comedies. I mean, with WHITE MEN CAN’T JUMP and MAJOR LEAGUE, he proved to be a true comic powerhouse. What went wrong, we ask ourselves? And hey MONEY TRAIN wasn’t a total disaster. We got to see a nekkid Jennifer Lopez after all. 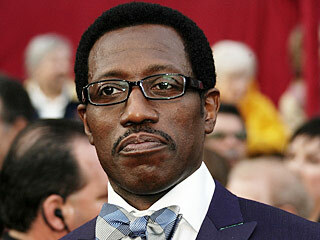 I like Wesley Snipes but he sure has been in a lot of movies I don’t care for. I like Spike Lee so I would have definitely included JUNGLE FEVER which Snipes is excellent in and MO BETTER BLUES for that matter. Did not care for Demolition Man or White Men Can’t Jump but I thought he was a hoot in Major League. 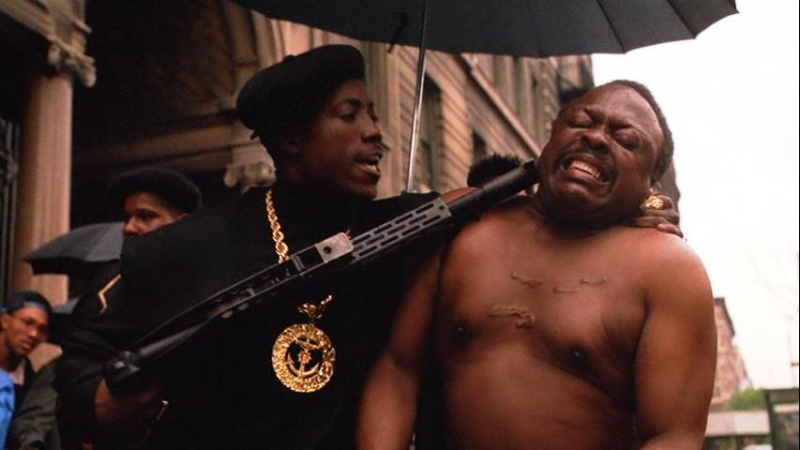 I think I liked New Jack City, although it has been years since I’ve seen it. Blade of course, well it probably would have gotten my number one spot too.